I don't know about you, but I typically wear less makeup in the summer. I do so for two obvious reasons. 1. I'm usually darker from the sun or a Mystic Tan. 2. It's hot as balls. It's a waste of good makeup if you're just going to sweat it off. In years past, I would wear tinted moisturizer. This year I jumped on the BB cream train. BB cream paired with a few other essentials makes for a light and fresh face. 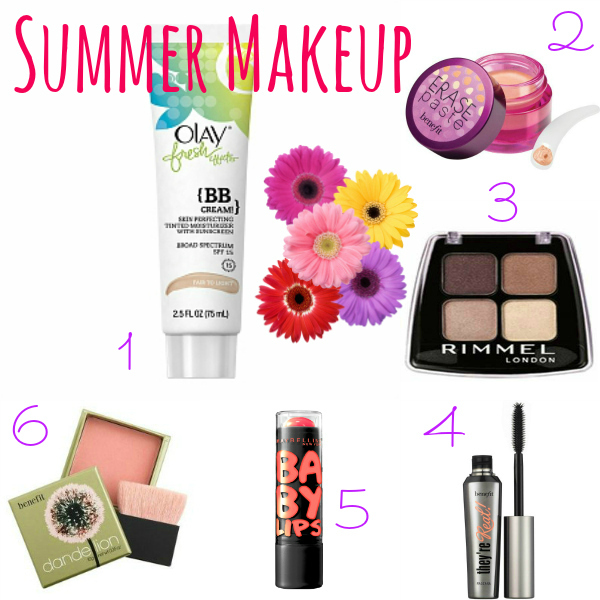 Here are the products I'm currently loving for summer. I definitely change up my routine in the summer. This summer I've basically gone without everything except BB cream. I just haven't felt like making myself up, I guess. I don't wear that much make up day to day at work year round. That BB cream looks awesome. I had to read the description to figure out what BB stands for. I've never tried that or even tinted moisturizer but I probably should because I refuse to wear liquid foundation unless I'm dressing up and going to a party. So, only like a few times a year. Tinted lotion would be a nice alternative for day to day. I have #2, #4 and #5. I love Benefit products. I don't think I stray much from my regular regime, but that's usually pretty simple anyway. I just keep it a bit lighter and add some major SPF. Gross. I'm looking forward to summer so my skin calms down from all the sunscreen. No matter how oil free/fragrance free/good for your skin it is, my skin still freaks out. I want to try that shade of Baby Lips and the Benefit powder! I am a huge BB Cream whore. I think I have about 6 different types alone in my medicine cabinet as we speak (to be fair it's probably only 4 brands, but different shades). I think that Olay smells the best but I love the coverage of Ponds and the Almay CC Cream the best. I need to get that Rimmel quad, that's perfect for me. and that baby lips shade is SO pretty!! How do you like the Erase Paste? OMG I am in total make up mode now. I am going to Sephora on Saturday to possibly change up my makeup regimen because I am sick of my current one....and I need to seriously snag that mascara..heard so much great stuff about it. How do you like the erase paste? Whats it like? Miley Cyrus done lost her damn mind. David + Harper Beckham are THE CUTEST!